Fishermen in Japan have begun their annual slaughter of dolphins in Taiji, on the Pacific coast of the country after the animals were corralled into a cove in the town last week. 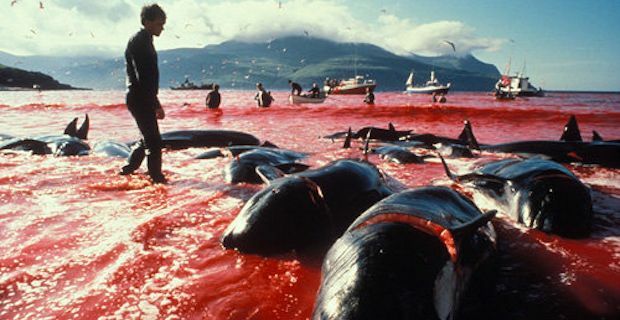 This annual killing was brought to international attention in 2009 when the Oscar winning documentary, The Cove, was released. Sea Shepherd, the marine conservation group, are monitoring the cull and stated that local fisherman had begun the slaughter of about 250 dolphins just before 7.30am yesterday morning. A number of the dolphins, including a rare albino calf, were removed from the pod and rather then be killed will be sold, likely for millions of dollars, to aquariums and water parks. The slaughtered animals will be used for meat which is seen as a delicacy and still forms part of the diet for those living in Taiji. Most other Japanese have rejected the meat. What has drawn most attention is the methods by which the dolphins are captured and killed. Having been man handled and likely injured while being corralled into the cove they are held in captive nets. Metal poles banging in the water confuse the dolphin’s sonar. Once in position in the cove tarpaulin covers are placed over the dolphins and the fishermen drive metal rods through the spinal cord of the dolphin and leave it to die – which may take 20 or 30 minutes. Once dead the dolphins are brought to a warehouse where they are cut up into meat. As the cull commenced yesterday, and the waters around the cove turned red from the dolphin’s blood, international condemnation began. Washington’s ambassador to Tokyo Caroline Kennedy took to Twitter to express her “deep concern” over the events in Taiji and Japanese artist and well known peace activist Yoko Ono also called for an end to the slaughter in an open letter to the people of Taiji. Despite condemnation Japan’s chief cabinet secretary stated "I believe dolphin fishing is one of Japan's traditional fishing industries and is carried out appropriately in accordance to the law. Furthermore, dolphins are not within the management of the International Whaling Commission and it is left to the respective nations to manage this resource. We will explain Japan's position to the American side." While a ban on commercial whaling was introduced internationally in 1986 this ban does not include dolphins or other small cetaceans. For now the debate will likely continue while this year’s pod will have been killed.